Creating your on-line approved supplier list. Moving your approved supplier list on-line is a great idea - easy to manage, gives you "at a glance" approval status, is free of charge* and keeps you up to date as to changes. Once you've created an AvSMART login and password, you can start to build your list, and add any fully registered supplier. Upon logging in, you are taken to your control panel, and from here you can search individual suppliers, by typing their name in the search field, or you can leave this field blank, click search, and reveal the full list. Some of the suppliers show a cog symbol. This means that they have registered at the invitation of one of our AvSMART Total airlines or MRO's, are a "Limited" registration, and only the requesting airline is able to add those suppliers, and has access to the full audit. Please contact us if you would like to add these suppliers - AvSMART Total may be a good fit for you, or we can approach these suppliers to discuss extending the accessibility of their form. You can read more about AvSMART Total here. For fully registered suppliers, clicking the plus sign adds that supplier to your list, and any time that supplier makes updates you will receive an email with the details of the updated fields. As you add the supplier, you will be asked whether you wish to advise the supplier they are now on your list. Clicking "Yes" means suppliers are more likely to keep their self-audit current, since they are aware you are monitoring them via the system. A green plus sign indicates the self-audit is current. Some suppliers will show an amber or red plus sign. This means they are in their final month before updates are required, or they have gone over a year since last updating. Where this is the case, you will see an envelope icon. Clicking this will send the supplier a message to let them know you would like to see updates made. Sign up for a free of charge MyAvSMART account today and start building your list. 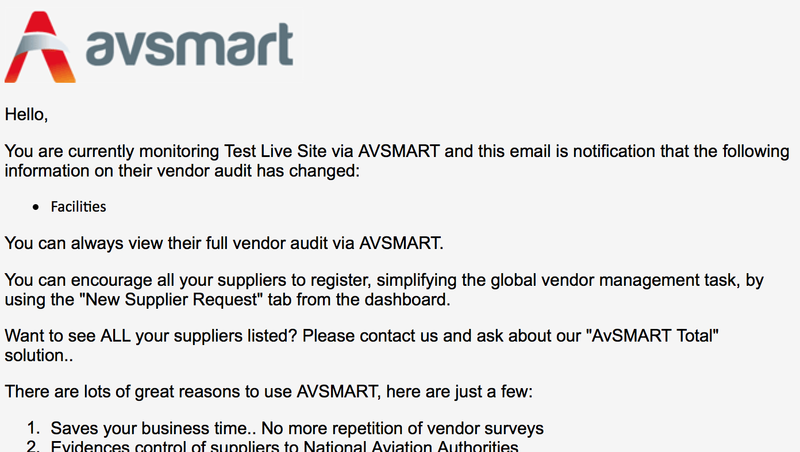 A note for suppliers: by telling all your customers your self-audit can be found at AvSMART.aero, you will receive less and less paper forms to complete, and will only have one on-line form to keep updated. We will cover this in more detail in a future article. *Free of charge when selecting full membership suppliers. Contact us to to discuss limited access suppliers, or moving your entire list to MyAvSMART. 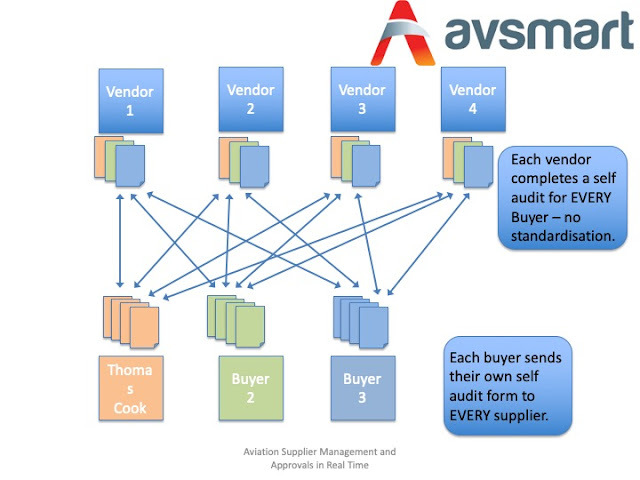 If you've heard about AvSMART but wonder what it's all about, or if it's news to you, here's a couple of diagrams I hope will explain. The first is a much simplified illustration of the traditional, paper-based self-audit method of information gathering. This is used by airline and MRO purchasing and quality departments to ascertain a supplier's approval status and quality procedures. We show four buyers and suppliers - in reality there are hundreds of buyers and suppliers worldwide - each one sending or completing these forms, resulting in much paper, time and energy wasted. Since this task is repeated every 2 years, that's an even bigger cost to each business. 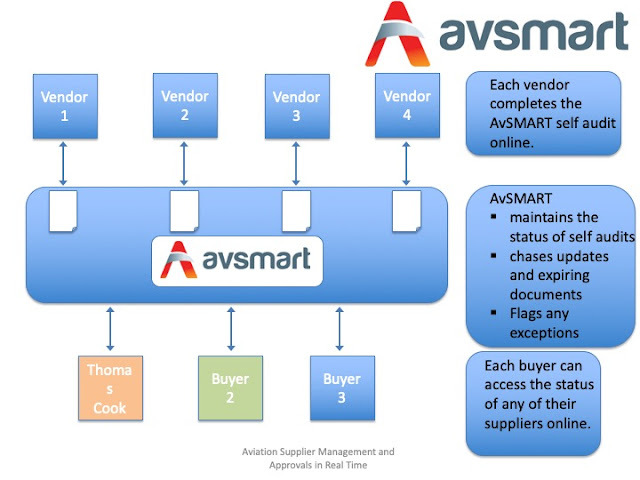 The diagram below shows how AvSMART has simplified this task. 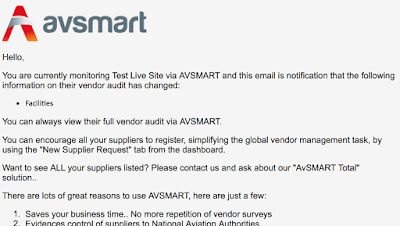 Just one, standardised self-audit form is completed by a supplier, and this is available for all customers to view and add to their "MyAvSMART" list. When updates are made by a supplier, e.g. new certificates added, a process change, or at annual review, automatic notifications are received by buyers detailing which fields of the audit and which certificates have altered. With the paper based method, unless pro-actively sought or supplied, any changes may not be communicated between audits. This is usually every 2 years. A lot can change in that time. AvSMART clients update at least once a year, and as often as changes occur. Using AvSMART, you have "at a glance" visibility of the self-audit status, and can be confident you have the most recent information. Buyers can create a login and password here, and start selecting fully registered suppliers today. Suppliers, please take advantage of the 3-month free of charge trial currently running. See how much time you can save and register today. 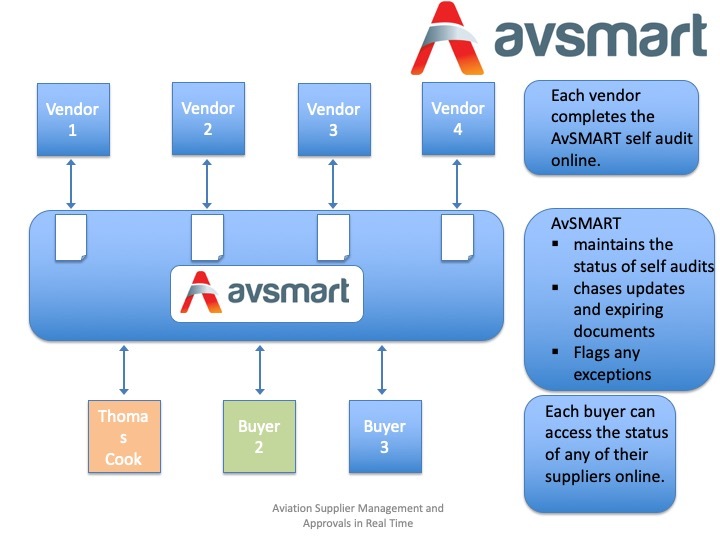 We've visited and consulted many airlines and MRO's and they love the AvSMART concept: All their suppliers' self-audits and approvals on-line, and automatic alerts whenever updates are made. With only one reservation.... "Not all of our suppliers are using the system". 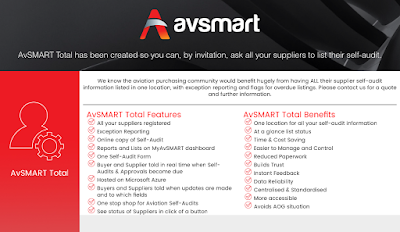 We've listened and created "AvSMART Total", your complete, "by invitation" approved supplier list on-line. Wouldn't you love to know the moment a supplier's status, approvals or quality procedures change? 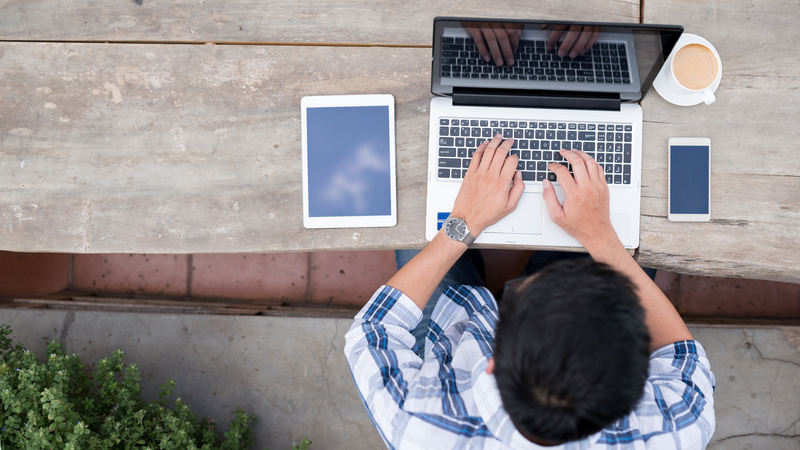 How efficient would it be to move your self-audits on-line? And to demonstrate to internal and external auditors you have the best procedures in place for ensuring compliance? Take a look at AvSMART.aero today or contact us to ask about AvSMART Total. 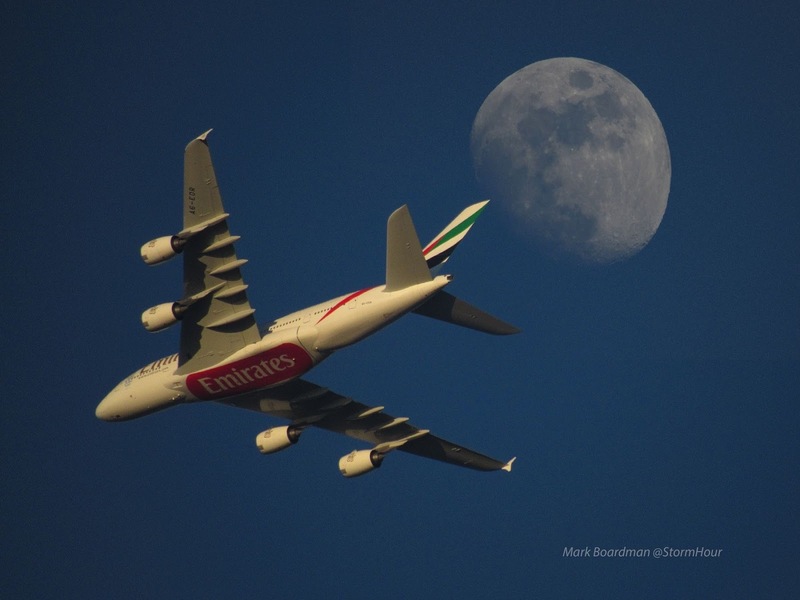 Shoot for the Moon at Trade Shows! You've invested your money, your stand looks fantastic, you have your literature, business cards, intellect and charm at the ready. We hope you do amazingly well, make new contacts, and sell, sell, sell! We want to make sure your contacts and prospects can buy from you with confidence and without delay. 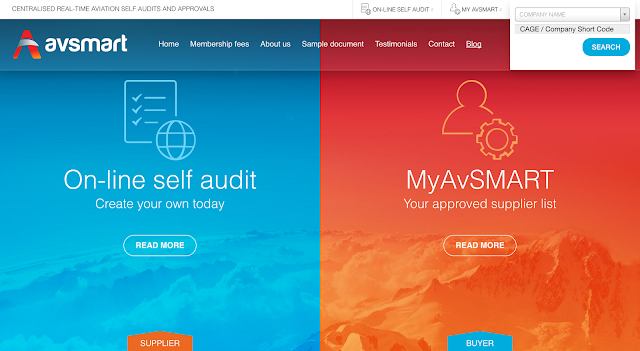 Having your on-line self-audit registered at AvSMART.aero means never having to complete another paper audit form. Simply direct your customers to AvSMART.aero and they can relax knowing, not only can they access your up-to-date information immediately, they will be informed automatically whenever you make updates. Registering and completing your self-audit is easy, time and cost saving and demonstrates compliance. We are so confident you will love the system, we'd love you to trial it for free. So register today, receive 3 months completely free of charge and shoot for the moon! Did you know that the "SMART" part of our name is an acronym - Supplier Monitoring and Approvals in Real-Time? We offer the unique ability to keep a track of your supplier self-audits, or to keep your customers informed, as changes happen. Why's that so great? The traditional way of obtaining or providing supplier quality information is via paper forms. Thousands of these forms are sent or emailed around the world each year and, as well as the monotonous, repetitive nature of sending / completing virtually the same form over and again, the big problem is that they can be out of date the moment they are returned. Keeping abreast of changes is a huge task for both buyer and supplier, and often changes aren't notified or discovered until the next round of self-audits, up to two years later. In an ideal world, physical audits are carried out on every supplier, but this process takes time and is rolled out over a number of years. With AvSMART, changes and updates are automatically communicated, which can help with scheduling and prioritising audit visits. Using AvSMART means, as a supplier, you can update anytime, anywhere in the world with an internet connection, using your phone, tablet, laptop or P.C. As a buyer, having suppliers selected for your MyAvSMART approved supplier list means you will be notified via email when these changes happen. And that's what's so SMART. Create your free of charge "MyAvSMART" approved supplier list today or register your self-audit - and enjoy 3 months completely free. May 2017: AvSMART launches our new website with a totally fresh look and simple navigation. The home page clearly shows the system is for both buyers and suppliers within the aviation community, click either section for more information. All subscribers will receive 3 months absolutely free of charge, allowing plenty of time to trial the system and discover the many benefits. As always, creating your preferred supplier list, selecting any listed suppliers, and receiving all updates to their self-audit is completely free. As if this weren't enough, we have created a referral scheme, rewarding our supporters with £75 for successfully registered companies with whom they have shared the many benefits of membership. There will be more about these subjects in upcoming blogs so please stay tuned! In this modern world where the internet makes everything a click away, fast, easy, reliable, why are we still wasting precious time and ignoring K. Bromberg's advice (the author of our title quote)? In 2007, I sat at the desk of my airline employer, sending out hundreds of self-audits for suppliers to complete, as those suppliers had, doubtless, recently completed for many other airlines and MRO’s. I knew this task would need repeating in 2 years time and wondered if I'd even have all of the original responses by then, such was the volume of forms sent. I yearned for time to do my “proper job”, buying aircraft spares, without staying late at the office to catch up. If I didn’t buy the spares, aircraft would be delayed. If I didn’t stay on top of vendor audits, Quality would raise a non-conformance against Purchasing. The upshot of this could be a hold on purchasing from non-responsive or slow to respond companies. Potentially this could also delay aircraft as we sought new suppliers. Neither job could be set aside. This is a scenario that I know from meetings with counterparts in airlines and MRO’s plays out in aviation engineering globally. Often quality and purchasing departments debate who should take responsibility because nobody wants the paperwork monotony and constant battle to keep everything up to date. The problem is as bad for the supplier, who no sooner completes the form than something changes, a certificate expires or a process in their quality system changes, and they need to contact all of their customers with the update. This added to the number of forms received, and the need to complete the whole form for every customer on a two-year cycle equates to an administrative headache. Wherever the task sits in your organisation, there is a way to liberate the time it consumes. AvSMART.aero was created to release your time and save you the paperwork and administration burden, providing online aviation vendor self-audits, with updates in real time. So if you want to escape the hamster wheel, simply use the system, and ask your suppliers or customers to use it too (we’ve even made this easy with our “Alert my Buyers” and “Request New Supplier” features). So whether you’re a buyer or vendor, quality or purchasing, make sure you’re saving time, or at least wasting it wisely. For more information see the website, previous blogs, or contact us for a demo.